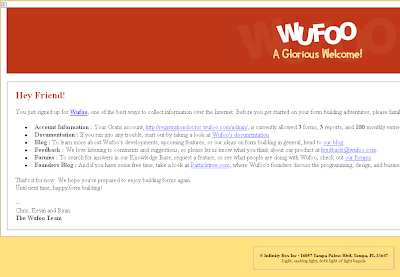 Ryan Manville pointed me to a form-builder application called Wufoo. The application is great for simple forms – but check out the "Welcome" email they sent me when I created a free account. It is like a checklist of the tools that you need to run a modern Web-based business. Compared to this checklist, how are we doing at Certain Software? Founders Blog: YES – We have one founder Blog, but it would be nice to have a couple more. On March 4, 2008, Certain Software and Amlink Technologies announced a merger to create "the largest global supplier of technology solutions for the meetings and events management industry". The adjective "largest" comes courtesy of the fact that we can chose the metrics to measure by. I count this as the fourth announcement in the past year of the creation of the "largest global supplier" among meeting software vendors (Starcite, Active Network, Cvent, and now Certain). I've personally never put much stock in the claim of being the biggest; to me it is more important to be the best solution provider for each invidual customer. It's like that Bank of America commercial says, "Our goal isn't to process a billion transactions each day; our goal is to process one transaction correctly, and then repeat that a billion times." How does it help me for you to be the "Largest"? As a customer, I would think, "This merger is great for you. I'm sure some people earned a well-deserved payout and you'll be able to consolidate some back-office functions. But what's it going to do for me? Will you stop developing the product I use now and force me to switch to another one, which I probably didn't choose for specific reasons when I purchased your product? Am I going to call my account manager of five years and get a nameless call center technician half-way around the world?" This is a challenge for us. At our first merger transition meeting, we established four goals for our quest to be recognized as THE global technology solution for the Events and Meeting Planning Industry. Notice that our first goal is to not affect our customers negatively. We are fortunate to have two strong companies and products, so it is more important to not break anything than to quickly "fix" something. Second, although we will continue to develop both the Events Pro and Certain Registration products separately for the rest of 2008, we've already begun to see the excitement generated internally by putting hundreds of years' of global event management software experience into the same room. We hope that customers will be beating down the doors to use our first jointly-developed product, but in the meantime, we won't slow down product support on either of our core platforms. Don't mergers mean layoffs and product cuts? I think that most people in our industry look at Starcite as the model for software consolidation, but our situation is very different. Starcite acquired RegWeb because they needed an online registration product, and they continue to support that platform today. B-There came in from bankruptcy, and thus its products and services were in jeopardy whether or not Starcite had completed the acquisition. Starcite and OnVantage merged while OnVantage was still digesting the merger of Plansoft and SeeUThere. By then, Starcite had acquired or built 3 solid registration systems and 2 basic ones, plus 3 meeting expense consolidation tools, two or more hotel databases, and dozens of offices world-wide. It's impractical to expect that they would have continued to support and develop all of those products and employees. Certain and Amlink, however, were in the position of having both strong products and financial positions. 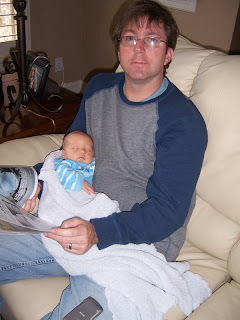 In the past 10 years of selling online registration software, I believe that the two of us were finalists in only one opportunity I worked on (the National FFA Organization, where I missed Trevor by a couple hours). Certain Registration was born as a Web-based Software as a Service (SaaS), while Events Pro is a traditional client-server Windows application. Certain is primarily U.S.-based, while Amlink's largest office is halfway around the world and dominates its chosen niche in Europe. Looking at these facts, it makes more sense to expect growth from this merger than cut-backs. I'm tackling a new challenge of leading the new Certain's merger transition committee. I have little global business experience, a 4-week old infant at home, and a mile-long list of objectives. But we'll tackle these as a team and make progress each day, and occasionally I'll share some lessons learned here. 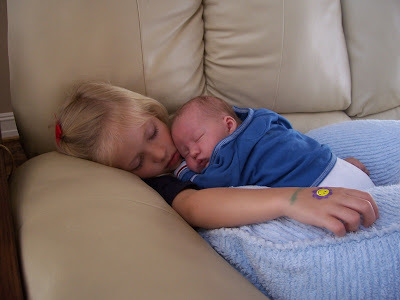 Being a big sister is exhausting! Rod Marymor was the founder of RegWeb, probably the first online registration application for event planners, which he sold to Starcite in 2002. He is now getting back into event planning software with ScheduleFlex, a scheduling tool for large multi-session events (>50 sessions), which he will offer to both event planners and registration company resellers. They build ScheduleFlex for an enterprise software company that hosted a 4-day conference recently with about 4000 customer attendees, 700 employees, and 800 sessions. Rod's company Cardinal Communications worked with Mike Graves and Brad Neuman at metroConnections of Minneapolis to develop the application, which was written by the original RegWeb architect Stephen Chang. The application was built using Adobe Flex, which produces a "Rich Internet Application" with a Flash-based front end. This allows users to have an experience more like a conventional desktop application (drag & drop text, select one option and dynamically update other options, etc.) compared to traditional web-based HTML forms. Cardinal uses a conventional configuration of Adobe ColdFusion MX as their middle tier and Microsoft SQL Server 2005 as the database. Here are some screenshots showing the application. You really need to click on each image and view the full-size photo in order to appreciate the beauty of the Flex platform. 1. 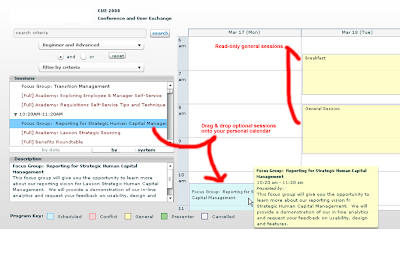 Attendee view of session scheduler, with filter-select-drag-drop capability to build your personal agenda. 2. 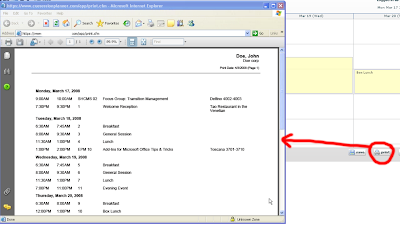 After building your schedule, print a personal agenda as a PDF document. 3. 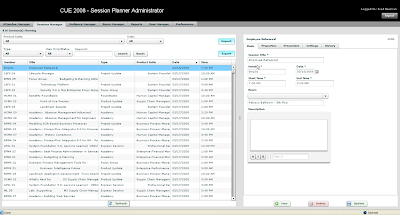 The admin-side (for event planners) of the application uses Flex's features really well to manage the huge amount of information inherent in multi-session conferences. With the pilot event, several thousand attendees logged on simultaneously when the sessions opened, and Stephen Chang didn't notice an appreciable load on the web server running the application. This processing efficiency results from much of the processing occuring on the user's Web browser, which makes small, infrequent requests to the web server for data updates. Stephen built batch import routines to upload tab-separated values as text files for both attendee lists and session lists. For example, after the event completes preliminary registration, they transfer attendee data to the session scheduler and then begin the session management phase. Stephen also built an API to allow transactional import of attendee information, e.g., as each registration completes, the registration system passes that data to the session scheduler so that the attendee can immediately begin to manage their sessions. If any sessions have associated fees, then the session should be selected in the registration system and paid along with other fees. For more information about ScheduleFlex, contact Rod at Cardinal. They did a nice job building a simple interface for a complex problem in event planning, and I expect to see more use of Rich Internet Applications in the future. 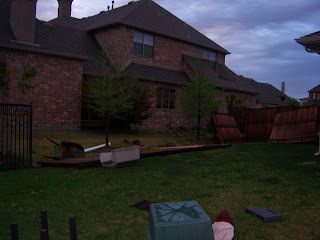 With a 3-week old baby and two six-month old puppies, I was enjoying a rare stretch of REM sleep Thursday morning when tornadoes hit the Dallas-Fort Worth area. Officially, the top wind speeds of 75-87 mph makes this a category 0 or 1 on the Fujita Scale, but I would not want to be around a category 5. I was sound asleep when the lightening flashes began at 3:30am. I laughed as the thunder rolled in, because I knew that the sleep was too good to last, but this time something was different. The sky was darker than usual, the lightening increased until it flashed without stop, and through the streaks I saw colors of blue and black that belong in bruises, not the sky. Next, I heard the sound of an onrushing train, followed by the shrill scream "Mommy!" coming from my 5-year old daughter upstairs. My wife was nursing our newborn so I ran upstairs, realizing that the power was out and with it our night lights. It was fire drill time - I sent Izzy crying down the stairs and pulled Cade out of his bed to follow. Then into Kyra's room to jerk her out of bed and drag her down into the tornado shelter we have under the stairwell in our closet. Mommy and baby sat in a heap of clothes while the other 4 of us huddled around the flashlight listening to the roar of the storm. It was over in less than 5 minutes. I went out to the garage to listen to the car radio (note to self: put an emergency radio in the shelter) and heard the news of the storm front travelling at 45 mph, already east of our town. The sirens had stopped, although frankly I had barely noticed them in the first place, and we began to lay out futons on the floor in our bedroom for the kids to sleep. 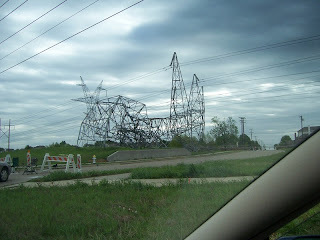 The morning commute to school was a complete mess, with power lines and fallen brick walls blocking every other road. But we had a beautiful sunny day, and by noon my phone, Internet, and power were restored. 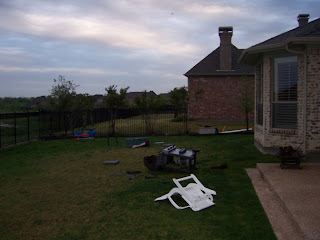 I got to meet many of my neighbors as we all cleaned up the mess, and apparently no one was injured in the entire DFW region, which is amazing. 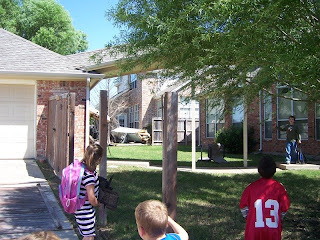 Here's a sample of photos around my neighborhood. That's my 75-pound propane grill tossed into the middle of the yard. There's a reason no sports teams choose "Fences" as their mascot - last night the score was Tornadoes 89,000 and Fences 0. "Chimneys" wouldn't make a good team name either - this one didn't do so well. 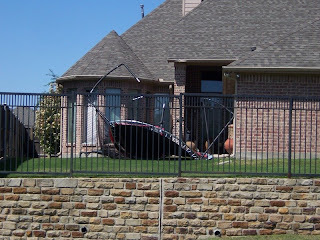 This trampoline went through the bedroom window. 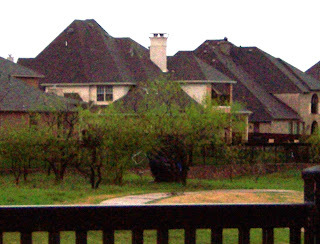 That black circle in the tree is my neighbor's trampoline, landed on the fairway 250 yards from home. Those who know me remember that's farther than any tee shot I've ever had. But all's well that ends well - this is Wilson at 2.5 weeks old.